The day after my trip to Nagasaki, it was time to head to Beppu, a hot spring resort town on Kyushu's west coast, and about two hours from Hakata on the limited express train. Although the main part of town is near the beach, the best parts of Beppu are in the surrounding hills, which you can get to by bus. Once up in the hills, the first thing you notice is the steam venting from all over the place - in the streets, between the buildings, and from the Hells themselves. It's very impressive! I decided to check out the Jigoku (Hells), first. I visited Kamado Jigoku (Cooking Pot Hell), which has several statues of demons and has some muddy hot springs. It was nice, but not really worth the entrance fee. The second hell, Umi Jigoku (Sea Hell), was far better, with beautiful blue water and a much more tasteful presentation. Finally I visited Chinoike Jigoku (Blood Pond Hell), which had one pond of blood red water. While very pretty to look at, it's also not really worth the entrance fee. I decided to cut my tour of the hells short, since it was getting on in the afternoon and all that sightseeing made me hungry. As part of the bus day pass I bought, you get several discounts on restaurants and onsens, so I decided to head to Ichinoide Kaikan, which wasn't listed in the Rough Guide but was on the map provided by the tourist information office. Unfortunately, the map wasn't topographical and I ended up on a 15 minute hike up the side of a mountain! It was definitely worth it though, since the view from the onsen was spectacular. From the milky blue outdoor pool you look out over Beppu, the harbour, and the bay beyond. On a good day, they say you can see all the way to Shikoku, and while it was a beautiful day there was the usual haze you see in Japan, so I couldn't see that far. 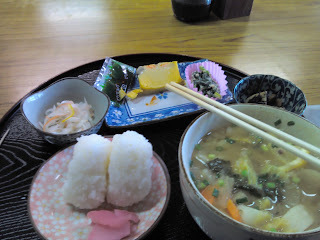 I didn't take a camera to the onsen as there were other people in it. This is someone else's picture taken from the second pool (on the day I went, set aside for men - the women's pool had a much better view). There are more pictures in the link above. One funny thing was, on the day I went they were fixing a tower a little down the mountain. The tower came up to about the same height as the onsen though. Once in the tub, several of us noticed that people were working in the tower (you can see it in the link to the website above), which the other women seemed to find hilarious. They kept saying, 'Today they are so lucky! But not yesterday!' (the pools switch genders each day). 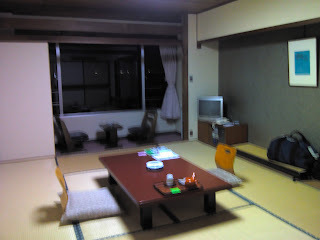 I think that this type of onsen might be a little intimidating for people new to onsen culture - for one thing, it's not in the guide books, and the staff (at least where I went) don't speak much, if any, English. However, once inside you'll find most onsens have English signs that provide clear instructions, and people are very friendly and welcoming. 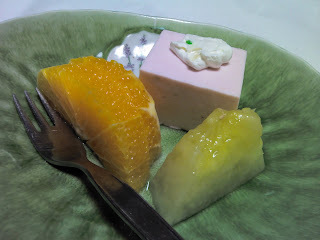 Part of the deal at Ichinoide Kaikan is a set lunch along with your onsen, but they prefer you eat after bathing. The set was really delicious and perfect on such a cold day! I wasn't done with onsenning though, and headed next to Onsen Hoyoland for a mud bath. The mud is slimy and a little unsettling, but it is still relaxing and a great experience. I highly recommend it! 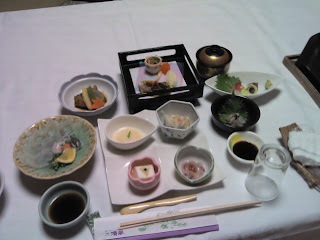 A kaiseki dinner came included, which was fantastic, but there was so much food. I'm sorry I couldn't completely finish it, because every bite was delicious. Beppu has been one of my favorite places so far on this trip, and probably one of the most authentic. If I were coming back to Japan it would definitely be a must on my list of places to visit. There were hardly any other foreigners there, and in some sense I felt like I had the place to myself! I can't recommend Beppu enough!